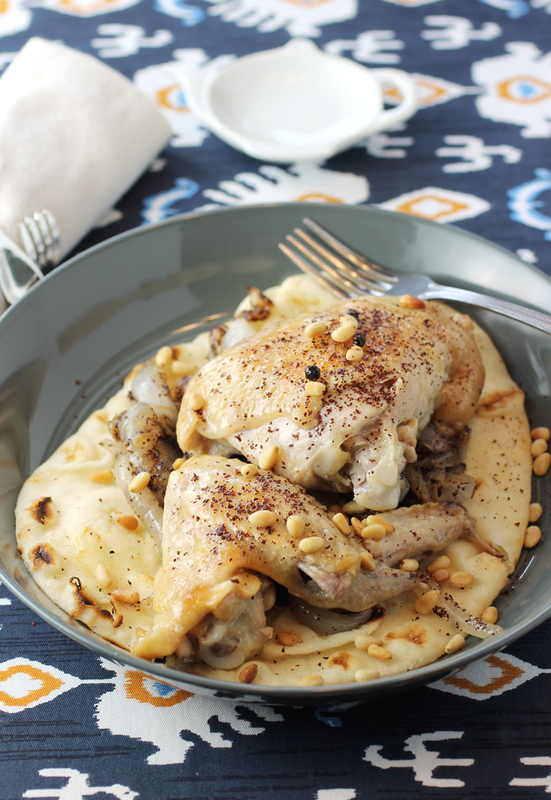 A simple chicken with sumac, onions and pine nuts, for the times. I know this may sound sexist and simplistic, but I truly believe if more women were in charge there would be fewer wars and conflicts. Women just have a natural tendency to want to talk it out — rather than use their fists or other weapons — to resolve situations. Just imagine if a woman were the head of state of Syria rather than the long-standing brutal male president whose crimes against humanity have left this once beautiful country devastated beyond imagination. Itab Azzam and Dina Mousawi know only too well the tragedy that has befallen the country. Azzam was born in Syria and moved to the United Kingdom in 2011, where she’s produced theater productions with refugees, as well as the Peabody and BAFTA-winning documentary series, “Exodus: Our Journey to Europe,” which chronicles the migration crisis. Mousawi, who grew up in Baghdad, produced and directed “Terrestrial Journeys,” a theater piece devised with Syrian women living in Beirut’s refugee camps. Through their nonprofit theater project, avid cooks and friends, Azzam and Mousawi met dozens of Syrian women refugees. As they got to know one another, the conversation naturally turned to food. 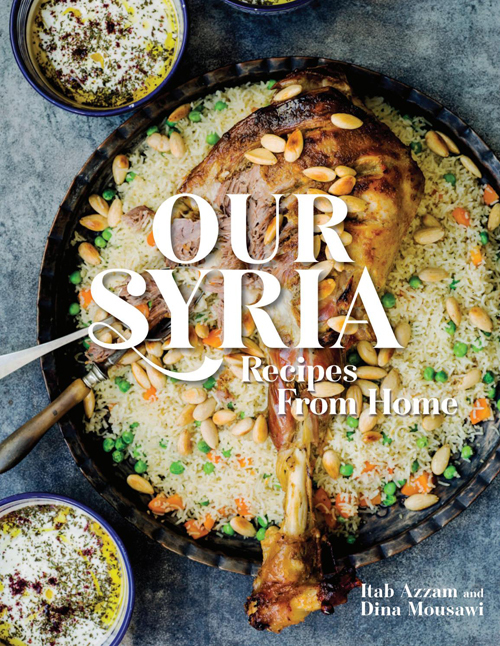 The result is “Our Syria: Recipes From Home” (Running Press, 2017) by Azzam and Mousawi, of which I received a review copy. The book showcases traditional Syrian home cooking, and the women who manage to carry on the practice of nurturing through food even when they are forced from their homes. 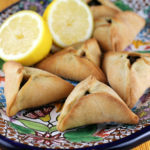 “Chicken with Caramelized Onions and Sumac” has little more than a half dozen ingredients. It’s your basic pan-fried chicken smothered with sweet onions and served on flatbread you can buy at the supermarket. Besides peppercorns, the only real seasoning is a generous amount of sumac. 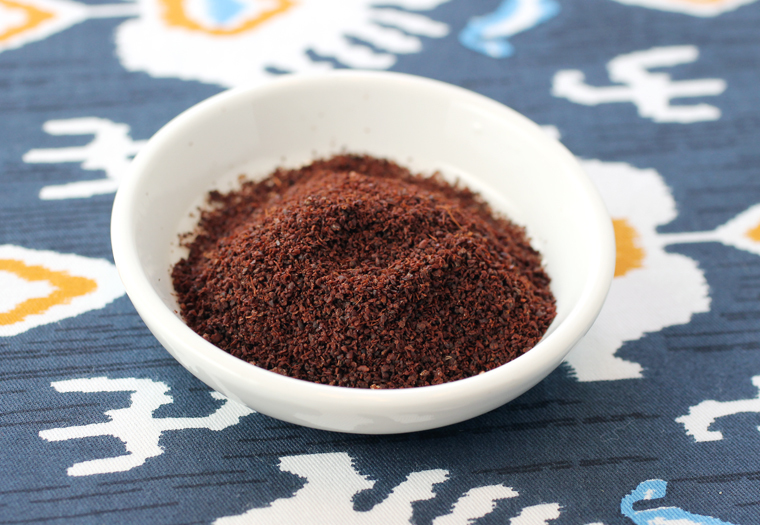 The deep reddish-brown ground spice has a fruity tannic puckeriness, though one that’s gentler and more complex than lemon per se. The only changes I made to this recipe were to salt the chicken, since salt was not included in the original recipe. I also changed the temperature for caramelizing the onions from low to medium-low because I wasn’t able to get a golden color on the onions without turning up the heat. And I noted that care should be taken when frying the whole peppercorns, as they have a tendency to pop out of the pan. For the onions, I used Vidalias, of which I recently received a sample box. These naturally sweet white onions are grown and harvested in spring and summer. They can be grown in only 20 South Georgia counties, and are all hand-planted and hand-harvested. 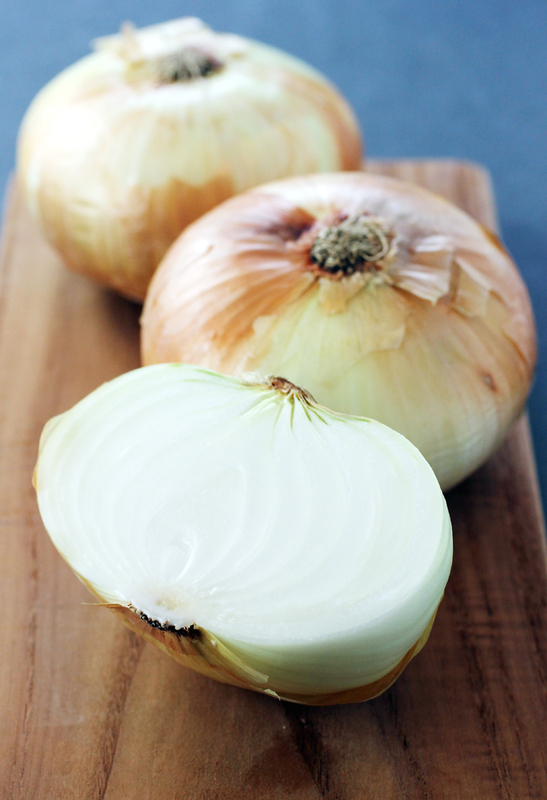 If you like a big slice of raw onion on your burger, these are the onions made for that because they don’t have that sharp bite of other varieties. 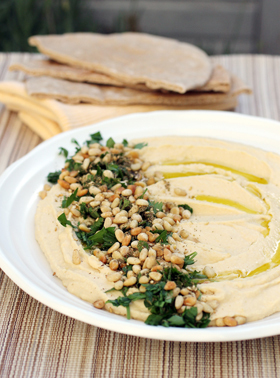 The tang of the sumac and the crunch of the pine nuts give this otherwise restrained dish its character. This is not a dish that’s going to hit you over the head with big flavor. Instead, it’s quite gentle, even austere, which is perhaps all the more appropriate given the times. Start by preparing the chicken. Heat a few tablespoons of the oil in a large saute pan and fry the peppercorns for a couple of minutes. Be careful, as they have a tendency to pop in the pan. Add the chicken pieces, season with salt, and fry for another minute. Cover with a lid and cook over low heat for 20 to 30 minutes, turning occasionally until crispy on all sides. Caramelize the onions in a pan with the rest of the oil over medium-low heat until they are completely soft and browned, about 30 minutes. Then add the sumac and simmer for about 5 minutes more. 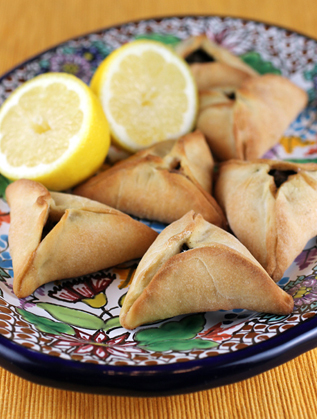 Lay the bread on a large plate or tray and spread the caramelized onions all over. 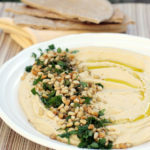 Place the chicken pieces on top and sprinkle with a bit more sumac and toasted nuts, if using. Alternative: You can also make mini wraps and serve them cold as part of a summer picnic. Simply shred the chicken, mix with the onions and sumac, and place in the middle of a tortilla, then roll up and cut into little finger-sized wraps. i’d love to try sumac! someone just recommended it as a replacement for ginger in recipes, so i’m definitely intrigued by that. the whole dish looks great!